The Burger & Brew Contest concludes on Friday, Oct. 13. Only days remain in the Tahoe-Truckee Burger and Brew Contest presented by Tahoe Magazine. Ten restaurants have chosen a beer and burger pairing, and it’s up to the public to pick the winner. Once you’ve given the following burgers a taste, cast your vote online at bit.ly/TahoeBestBurger. Each pairing is priced at approximately $20, and voting closes Friday, Oct. 13. The winner receives a write-up in the 2018 summer edition of Tahoe Magazine and a plaque noting the win. This Tahoe City establishment’s pairing includes the Fat Cat Mac Burger, the house mac ‘n’ cheese served atop a Bently Meats burger along with lettuce, tomato and onion. The meal comes with house-made fries and is paired with a pint of Firestone Walker’s 805. Fat Cat is located at 599 N. Lake Blvd. At West Shore Caf? 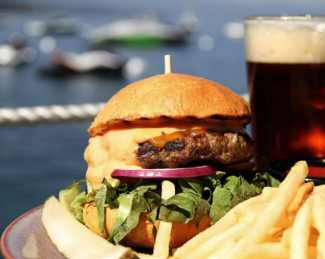 the featured pairing includes the West Shore Burger — an eight-ounce patty cooked medium and served with lettuce, tomato, onion, cheddar and west shore aioli — and a pale ale from Tahoe’s own Alibi Ale Works. West Shore Caf? is found at 5160 W. Lake Blvd. in Homewood. Truckee’s FiftyFifty Brewing Co. pairs its Session 267 IPA with The Adrian, a half-pound, all-natural Painted Hills beef patty topped with house-made thousand island dressing, fresh mozzarella, pickled jalape?os, avocado, lettuce, tomato, onion and pickle. Get a taste at 11197 Brockway Road, Suite 1. Smokey’s Kitchen, located in Truckee, pairs Deschutes Brewery’s Mirror Pond Pale Ale with its Pork Me Burger. The seasoned ground pork patty is topped with pulled barbecue pork, cheddar cheese and bacon. Head to 12036 Donner Pass Road to sample the duo. Blue Coyote offers a half-pound burger with green chiles, saut?ed onions, bacon and pepper jack (known as the Santa Fe Burger). The meal is paired with a pint of Lagunitas Brewing Company’s IPA. The Truckee bar and grill is found at 10015 Palisades Drive. The last of the Truckee eateries, Mellow Fellow offers its Chorizo Burger (house-made Basque chorizo with smoked cheddar sauce, jalape?os, tomato jam and pickled red onion) alongside an IPA. Mellow Fellow is located at 10192 Donner Pass Road. Stateline’s Straw Hat Sports Bar & Grille offers the Joe’s Special burger. Melted cheese, bacon, lettuce, tomato and onion top a locally sourced beef patty and are served on Truckee Sourdough’s brioche bun. The burger is served with a choice of French fries or tater tots and paired with a Stella Artois. Straw Hat is inside Harveys Hotel and Casino, at 18 U.S. 50. In Zephyr Cove, Toast Tahoe serves up its Toast Burger, comprised of wagyu beef, white cheddar, lettuce, tomato, onion, bacon, avocado and homemade Cajun aioli served on a Truckee Sourdough brioche bun. The burger is served with beer-battered fries and is paired with a pint of Sapporo. Toast Tahoe is located at 605 U.S. 50. MacDuff’s Triple B Burger is named after its ingredients: In addition to including home-made bleu cheese and bacon (peppered in-house), the burger also features farmers market heirloom tomatoes, house-made pickles and lettuce, and is served on a home-made bun. The meal — served with fresh-cut French fries — is paired with Lost Coast Brewery’s Scotch Ale, which was brewed specifically for MacDuff’s Public House. The restaurant is in South Lake Tahoe, at 1041 Fremont Ave.
South Lake Tahoe’s Burger Lounge matches its Heavenly Burger — a half-pound patty with mayonnaise, lettuce, tomato, avocado, cheddar cheese and bacon served on a grilled sesame bun — with Firestone Walker’s 805. Taste the duo at 717 Emerald Bay Road. 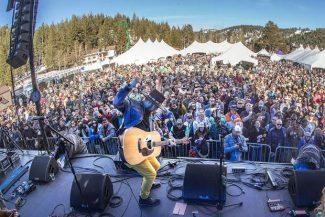 This contest is a promotional effort of Tahoe Magazine, a specialty publication by Swift Communications, which is the parent company of Lake Tahoe Action and the Tahoe Daily Tribune.